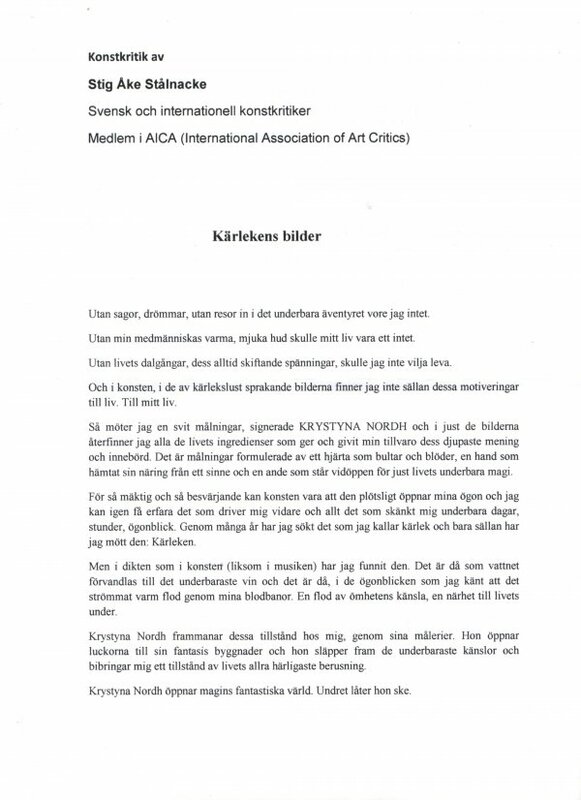 Member of AICA (International Association of Art Critics). "Without sagas, dreams or voyages into wonderful adventures, I am nothing. Without the warm and soft skin of my fellow human, my life would be nothing. Without the ups and downs and the ever-changing excitement of life, I would not want to live. And in art, in pictures bursting with love and lust, I find a reason to live. And the meaning of my life. That is how I experience a collection of paintings signed by KRYSTYNA NORDH and in those pictures I re-discover all the ingredients of life that give, and have given, my life its deepest meaning and significance. They are paintings created by a heart that pounds and bleeds, a hand that has drawn its sustenance from a mind and a spirit that is wide open to the wonderful magic of life. So powerful and so incantatory can art be that it suddenly opens my eyes and brings me back to experience the essence of what drives me on and all the things that have given me wonderful days, times, moments. Over many years I've been searching for what I call love, but only rarely have I found it. But in poetry, art and music, I have found love. In art, water is turned into the most wonderful wine and it is in those moments, I feel a warm river flowing through my bloodstream. A river of tenderness and an affinity to the miracle of life." Krystyna Nordh evokes these emotions in me through her paintings. She opens the doors to the structure of her imagination and she releases the most wonderful feelings to impart to me a state of the divine intoxication of life. Krystyna Nordh opens the amazing world of magic. She makes the miracle happen. After a long time writing about art, after many years of encounters with pictures, paintings, I know that words can easily become a poor attempt to describe what happens when you experience art. But Krystyna Nordh’s paintings never hide behind simple effects or tinkering with motives or ideas. No, she embroiders with the most wonderful tapestry of sights and impressions resulting in the pure song of love. Not a single picture tells a lie or gives in to simple effects. No, never a tone that is shrill or false. Instead, they are pictures that sing the purest song about the fragility of life and its immeasurable wealth. The artist who can show such images, which I try to put to words, has to be blessed by the strongest sense and the purest experience. These pictures of the beauty of humanity pluck a string of tenderness that brings to me a tide of happiness. Man is bestowed the miracle of writing a poem that warms, that seduces and that can open minds. This also applies to the best and most sincere of painters and artists. They can with their paintings give us experiences that bring happiness, insight, experience and a sense of the miracle of life. So, in truth, I find this in very few artists that I meet. There are very few such poetic painters alive. But Krystyna Nordh makes, with her pictures, my day bright and warm, wonderful and rich. She manages to embroider a beautiful tapestry of dreams and, in all honesty, I can never get enough of her poetic stories. It is a love letter in the form of a painting that she sends to me and to all who experience her work. She has revealed the miracle of painting and life. 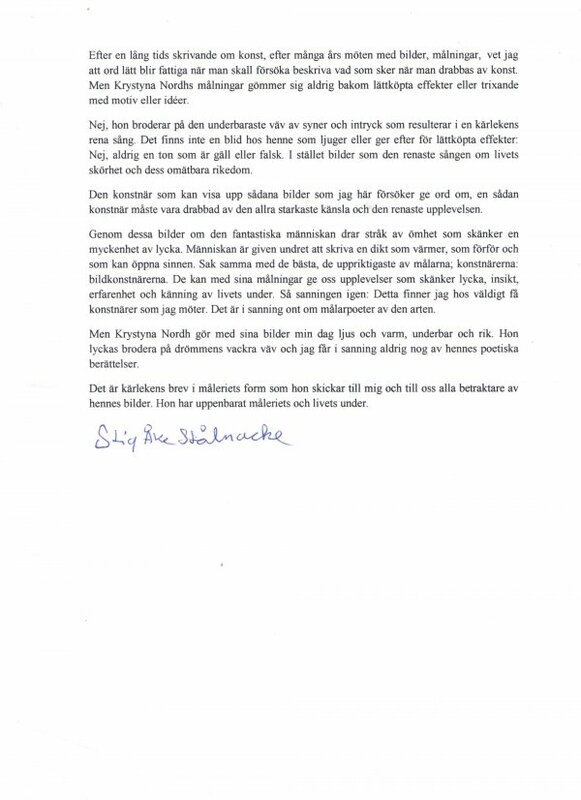 Konstkritik av Stig Åke Stålnacke, del 1 och 2.